What to Eat in Alexandria, Egypt – The Best Egyptian Food in Egypt! As soon as you arrive in Alexandria, you know the food is going to be good! 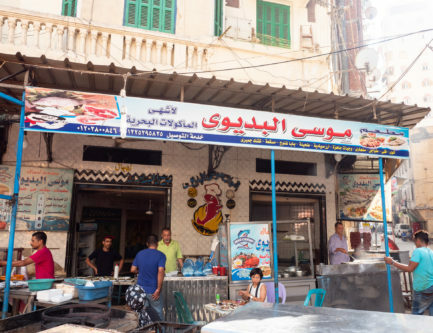 Located right on the seaside in Northern Egypt, there's a refreshing coastal breeze that invites you to explore the historical back streets to find what to eat. 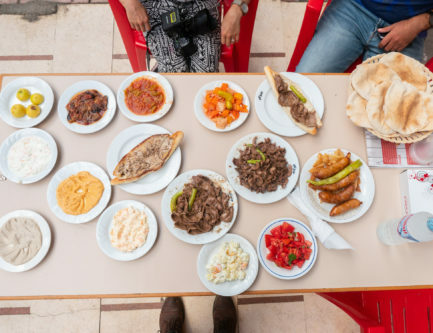 We ventured around Alexandria, Egypt for a day with our local friend Mohamed who showed us the best food to eat in Alexandria. This is what we found! 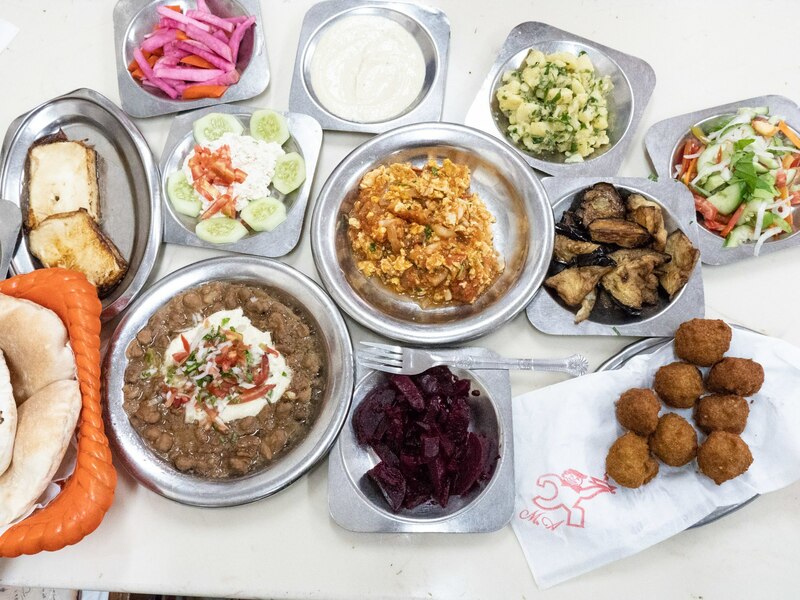 Eating Egyptian breakfast is one of the most memorable things you can do in Egypt, and this Egyptian Breakfast is no exception, it will blow your mind! The Foul Fava bean dip comes with tahini and a light tomato cilantro salsa, and the felafel is shaped into round balls! When you sit down, the waiter brings you a table full of delicious side dishes to dip your baladi bread into as well! 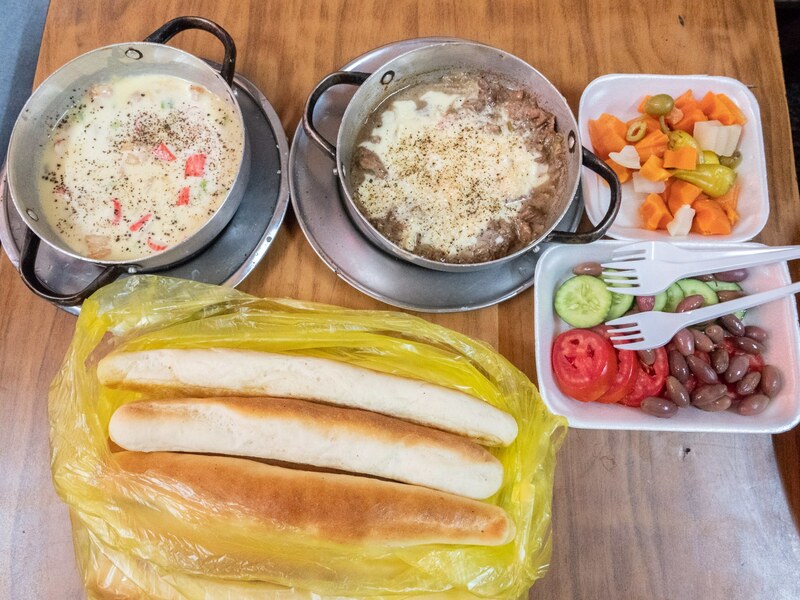 Coming to Egypt I never thought there would be a famous fondue dish, but here in Alexandria it is a must try! 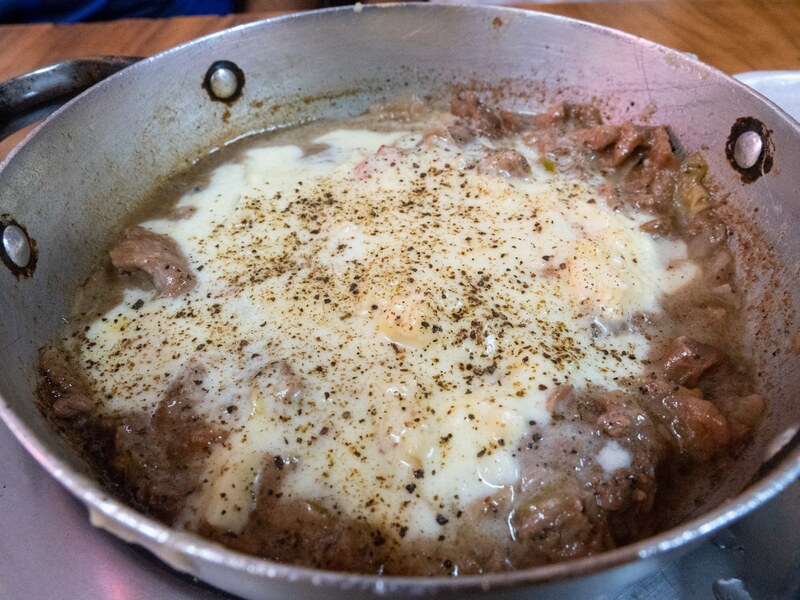 Their secret 7 cheese mixture is amazingly fragrant and you can order it with a huge variety of different meats or seafoods. I ordered the beef with caramelized onions and pepper along with the shrimp and crab sticks with cheese. Amazingly creamy and cheesy! You can take your Vino bread sticks; a very soft almost baguette like bread, break it and make it into a long spoon, and scoop up your delicious Egyptian fondue! Must Order: The beef with onions is called "lahma bel basal" and the shrimp and crab sticks is "fwakeh el bahr". You can also say seafood as it will be understood in English! Comments: There may be a long lineup! Hours: Always busy, best to come earlier, but you can also come late at night too! This was honestly some of the best seafood I ever tried. 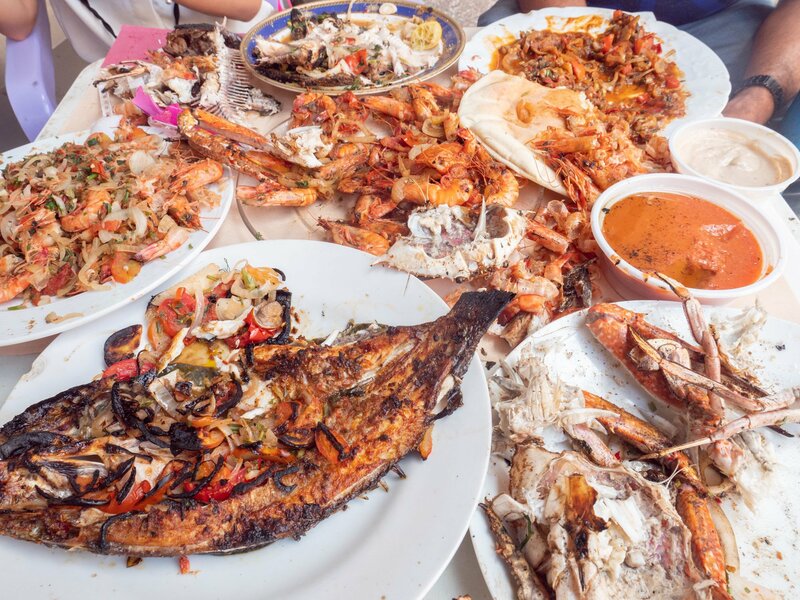 Located in a busy seafood market of Alexandria, the best part is how you can purchase all of your seafood fresh right in the market and bring it literally 5 meters to the side to one of the busy seafood grills. You only pay their cooking fee, which was modest, 80 EPG, around $4 USD. My favourite dish was the squid with tomato, onion, chili, and cilantro. It was amazingly fragrant and slightly sweet from the onion, with a slight spicy kick from the chili! 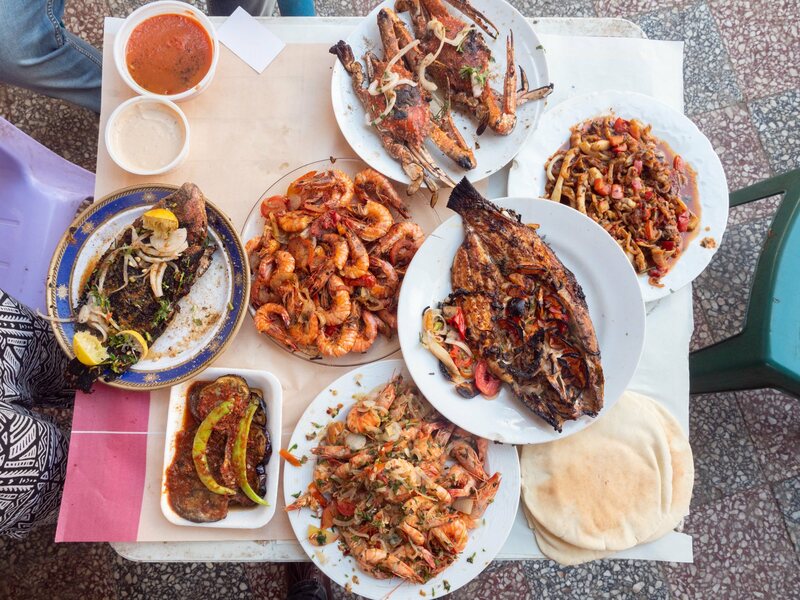 All of the Egyptian seafood is cooked here in many different ways, allowing you to try many different flavours, so make sure to buy a lot of seafood from the market! Get some crab, fish, and squid! It was all covered in a super refreshing tomato, cilantro, lemon sauce and gets really messy and enjoyable! Must Order: It's prepared many different ways. Try to eat one of each different style; baked, grilled, sauteed. Comments: Best dish was the squid! Price: Pay their cooking fee, usually around 2$ to 5$. Hours: Come early because the fresh seafood in the market is in the morning. Ideally come before 12 oclock. Although this is just one dish, there are actually many dishes that come with it! While the liver sandwiches weren’t my favourite, the selection of side dishes and the pure variety of flavours alone is worth coming here for! As with most Egyptian restaurants, there’s delicious humous, tahini, baba ganoush, and vegetable dishes. I hope you enjoy my new blog! I’m going to be creating these guides and posts for you so that you can follow along when you travel! My goal is to help you find the best food possible and to document the delicious food that we find along the way! Amazing article and video as well, was so happy when I found you came to Egypt, Looking forward for ur visiting cairo, BIG BIG fan .. Great effort you have done. Nice video, one of the best I’ve seen for Alexandria. – If you’re still in Alexandria, try having breakfast at Trianon Le Salon in Raml Station. Thank you for coming and visit Alexandria, what a pleasure to know that you were in Alexandria the wonderful and beloved city. I Wish you visit us again and test other street food and places. Great and interesting episode to be watched many times. Hi Walid, thank you so much!! I’m so happy to know you liked the video! That would have been so nice to meet! because every city has a famous &distinguished food of it . Thanks so much for the recommendations Asma!! You capture Alexandria so well and seeing you enjoy the many places that I grew up going to is so heartwarming! 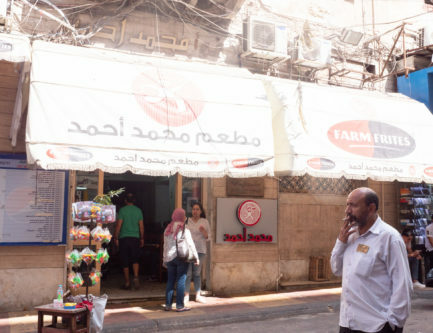 If you are still in Alexandria and want to change your mind on liver, try Al-Fallah! 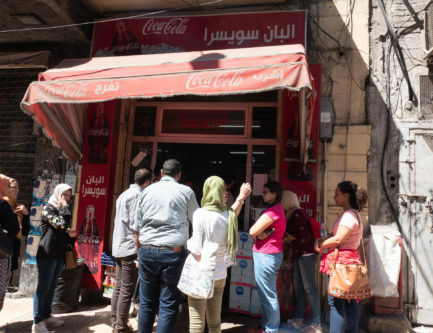 The only thing on their menu is liver sandwiches though, but people from all around Egypt make sure to stop by when they visit Alexandria for their signature sandwiches. U should come again .. Here every part of egypt has a different taste of food .. U must go portsaid . they make saiyadia dish .. Upper egypt while baking go for anther level .. Trying fattah , bamia tagen , dokka , mahshy , mesaa and alot of delious dishs ..watting for u.